Metro Atlanta is Georgia's principal urban area, and the eighth largest metro area in the United States, with a population of over 5.5 million. It encompasses Clayton, Cobb, Coweta, Dekalb, Douglas, Gwinnet, Henry, Fayette, & Fulton Counties. Georgia's capital and largest city. The city limits are convoluted due to extensive politicking, so Atlantans tend to think of I-285 (the beltloop highway 10 miles outside the city, often called the Perimeter) as the practical border of Atlanta, and often speak of destinations as being ITP (inside the Perimeter) or OTP (outside the Perimeter). Fayetteville and exclusive Peachtree City, home to many well-paid Delta pilots. Great places to go in Metro Atlanta, that are safer than Downtown are Buckhead, Gwinnett County, and Cobb County. Gwinnett and Cobb Counties boast a great enviroment for people who want to leave the city and explore nature. For example, a really good place to go is Stone Mountain Park, which is in Northern Dekalb County. It is a great tourist attraction for families and people who love the enviroment. It has a beautiful lake and a plantation on it, which is open for tours for a history buff. Also in Cobb County, is the Cobb Galleria. This holds amazing Broadway plays and shows, shopping, and much more. Also, for the family Six Flags is a great place to go (but not at night) to have family fun. In Hall County, which is a short ride up Interstate 85, is Lake Lanier. It is a huge lake with boating and many other tourist attractions. Lake Lanier Islands is a water park and resort for a family. In Gwinnett, you might also want to visit Historic Lawrenceville, Historic Lilburn, or Historic Duluth. These places have fountains and old buildings that are immaculantly preserved. Make sure to visit these places in Gwinnett County. Spring in Metro Atlanta lasts from Mid-March to Late May and is characterized by moderate rainfall and mild daytime temperatures. Average daytime temperatures range from the low 60s to the upper 70s and nighttime temperatures range from the upper 30s to the low 60s. Summer lasts from Late May to Mid-September and is hot and Humid. Unlike in the southern regions of Georgia, rainfall isn't particularly high during this season. However, rainfall totals about 5 inches in July. Average daytime temperatures range from the low 80s to the low 90s and nighttime temperatures range from the low 60s to the low 70s. Autumn or Fall lasts from Mid-September to Late November and features mild days and cool to cold nights. Rainfall slowly declines in August, September, and October but increases again in November. Average daytime temperatures range from the low 80s to the low 60s and nighttime temperatures range from the low 60s to the upper 30s. Deciduous trees in this region typically have peak autumn color around Early and Mid-November but varies based on sunlight, elevation and the type of tree. The Winter season lasts from Late November to Mid-March and is considered mild compared to Winters in Northern states but is chilly nonetheless. Frosts are common and occur almost 50 times a year on average. Average daytime temperatures range from the low 60s to the upper 40s and nighttime temperatures range from the upper 30 to the low 20s. Snowfall occurs annually but is mostly light. However, on occasion heavier snowfall can occur. Heavy snow can be very unsettling for people in Atlanta and many are not experienced with how to properly handle snow. Also, it is not uncommon for ice to form on outdoor surfaces on cold nights even if it does not snow. Often times the ice is very clear and can be easy to overlook so please be cautious. Located in Northern Georgia, Meropolitan Atlanta is a diverse set of people who are different from county to county. Centered by Atlanta (Fulton County), and outskirted by Gwinnett, Cobb, Hall, Forsyth, Walton, Dekalb, Clayton, and Gilmer just to name a few. The Metro Atlanta area has 28 large Counties spreading from the Georgia-Alabama Border, east to Athens, south to about Macon, and north to Jasper. It is over about 8,376 square miles and holds over 5,475,213 people, making it the ninth largest metropolitan area in the United States. With no natural features to constrain its growth, Atlanta tends to grow out rather than up, leading to massive urban sprawl. Atlanta is also at the junction of three major U.S. Interstate Highways, which contributes to its reputation as a driving city. Many people assume Atlanta is hot during the summer. They're right, but it's not as bad as it sounds; overzealous air conditioning and sweet iced tea make it bearable. If you do spend time outside, shorts and sandals are the norm from May to September. Autumn is mild, but temperatures can stay high through October before really dropping. Winters are unpredictable; most years see some freezing temperatures, but a couple days of sunshine can unexpectedly bring the temperature to the 60s or higher. Anything more than a dusting of snow is uncommon; when it happens, drivers will forget how to drive, stores will sell out of eggs and milk, and schools and businesses will shut down. The more usual problem is ice, which happens when daytime temperatures rise just enough to melt the snow, which then refreezes on the streets overnight. Spring is mostly marked by an unpredictable rainy season, interrupted by a torrent of pollen that turns every car in the city a dusty yellow for two weeks. Most of the people you'll encounter will speak standard American English, more or less, but you will hear people with a thick southern drawl. Asking them to "talk normally" will not get you anywhere; you'll just have to figure those vowels out on your own. There's plenty of southern hospitality here; take the time to start conversations with "Hi, how ya' doing?" before getting to whatever it was you wanted to talk about. Although Atlanta is often known by nicknames like "The ATL", "Hotlanta", and "The Big Peach," no one uses these names in conversation. If you say these to locals they'll know you're a visitor. Metro Atlanta is serviced by Hartsfield–Jackson Atlanta International Airport (IATA: ATL ICAO: KATL), often referred to by locals as "Hartsfield-Jackson," "Atlanta," "ATL," or simply "the airport." It is located about ten miles south of downtown Atlanta, so you will need to take public transit, a cab, or a rental car in to the city. Atlanta has been the world's busiest airport since 1999, and is a major hub for Delta Air Lines and AirTran Airways. 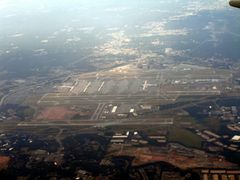 Although most passengers fly through Atlanta as a connection rather than a destination, few complain about the airport, which has excellent service and a largely headache-free layout (unlike other large airports like Chicago-O'Hare). Several other airports serve general aviation traffic around Atlanta, including DeKalb-Peachtree Airport (IATA: PDK) and Fulton County Airport (IATA: FTY). Atlanta is served by Amtrak on the Crescent Line, with direct service to New York, Philadelphia, Baltimore, Washington, Charlotte, Birmingham, and New Orleans. Atlanta has a rail/bus system, and surrounding counties have some buses as well, but the fastest and most reliable way to see Metro Atlanta is by car. See Atlanta#By transit. Outside Atlanta, the bus systems are primarily for commuters, and will be of so little use to you that you might as well ignore them. Because of its massive urban sprawl and highways running in every direction, Atlanta has always been a car city. With the exception of a few specific areas, most places are best accessed by car, even if they appear to be only a short trip away. Driving in Atlanta can be intimidating. Speeding is endemic; expect most highway drivers to go 75mph in suburban 55mph zones and 60mph+ in the downtown 45mph zones, while speed demons blow past at 80mph or more. Highways are up to 7 lanes wide in each direction, and drivers weave back and forth with little regard for lane ettiquette or turn signals. As an unwritten rule, the police do not generally stop highway drivers for going 60-75 if they are keeping up with traffic; unfortunately this means if you do get stopped, you will probably have a massive ticket for going 20mph or more over the speed limit. Unfortunately, the interstate highways really are the best to get around metro Atlanta. U.S. Highways are generally urban arteries with low speed limits, lots of lights and lots of traffic. Only about a half-dozen of the Georgia State Routes in metro Atlanta are limited-access. The best thing you can do is keep pace with traffic and be alert for drivers around you who will pull hazardous maneuvers. In conversation, highways in Atlanta are referred to by number: 75, 85, 285, and 400 (but usually I-20, oddly enough). I-285 forms a complete loop around the city with about a 10-mile radius. This is known as "the Perimeter". Rather than using cardinal directions, people (especially traffic reporters) refer to the "inner loop" and "outer loop"—clockwise and counterclockwise, respectively. The northern intersection of I-285 and I-85 is "Spaghetti Junction," and I-285 and I-75 on the north end is sometimes called "the Cobb Cloverleaf." Downtown, I-75 and I-85 merge into a single highway for 7.5 miles; this is called "the (Downtown) Connector" or just "75/85." This is one of the busiest stretches of highway in the U.S.; it has high traffic not only during rush hour, but also on weekends when special events are taking place downtown (which is at least every few weeks). During peak traffic times, traffic meters on many on-ramps use stop lights to space out cars in order to avoid jams. Flashing lights and signs saying "Prepare to stop" will warn you when the meters are in effect. Treat the meters like ordinary stop lights when lit, and ignore them when off. Several of the interstates in and around Atlanta have a High Occupancy Vehicle (HOV) lane on the far left, separated by a double white line and marked with diamonds. These lanes are for vehicles with 2 or more people (including the driver), motorcycles, and clean fuel vehicles (which must be licensed with a alternative fuel license plate). They are in effect 24/7, and there is a hefty fine if you're caught using the HOV lanes when you're not eligible. The HOV lanes can only be entered or exited where the double white line is dashed, not solid, although this is rarely enforced. Atlanta is also experimenting with High Occupancy Toll (HOT) lanes, which visitors will find less helpful. They are similar to the HOV lanes, but vehicles with 1 or 2 occupants can use the lanes by paying a variable-price toll. The toll is only payable by ordering and installing an RFID Peach Pass, making it generally impractical for anyone staying less than a month. Vehicles with 3+ occupants can use the lane for free, but must still have a Peach Pass and must set their Peach Pass account to free mode at least 15 minutes before using the HOT lane. Atlanta is not a walking city. Sidewalks are often narrow—when they are present at all—and reckless drivers who speed and run red lights make it unpleasant, if not dangerous, to walk. Moreover, things are so spread out that it's impractical to do much of anything if you walk there. A few tightly-knit parts of town are walkable. Downtown is fairly pedestrian-friendly, as is Midtown to a lesser degree. Virginia-Highlands and Decatur are both great for walking, especially if you're bar-hopping. Likewise, some of the historic towns like Roswell, Norcross, and Marietta have centers that are walkable. Generally, though: Unless walking is mentioned, assume you're better off driving. Because of Atlanta's layout, its hilly location on top of the Eastern Continental Divide, and reckless drivers, biking can be unpleasant for getting around the city. As with walking, some parts of town are better suited to it than others. Midtown and Decatur are particularly amenable to bicycles, and quite a few residents in these parts get around with one. Only consider biking if you're practiced at sharing the road in an aggressive urban environment. The good news is that MARTA allows bicycles on all buses and trains. On buses, you must use the bike racks, which hold 2 bikes and are first-come, first-served. There's a long multi-use path from Midtown through Decatur out to Stone Mountain. Atlantic Station in Atlanta/Midtown, a newly-developed pedestrian-friendly shopping district intermixed with moderately upscale restaurants. Mall of Georgia in Buford. The largest mall in Georgia.